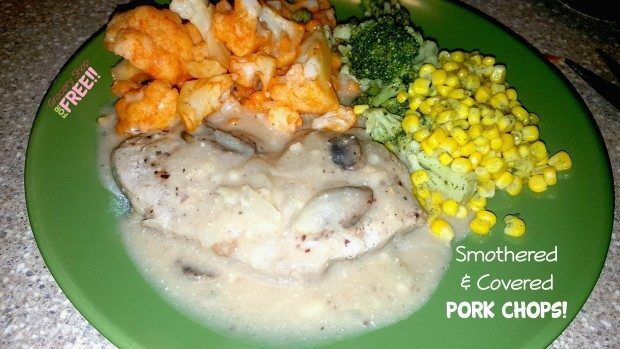 Smothered And Covered Pork Chops Recipe! 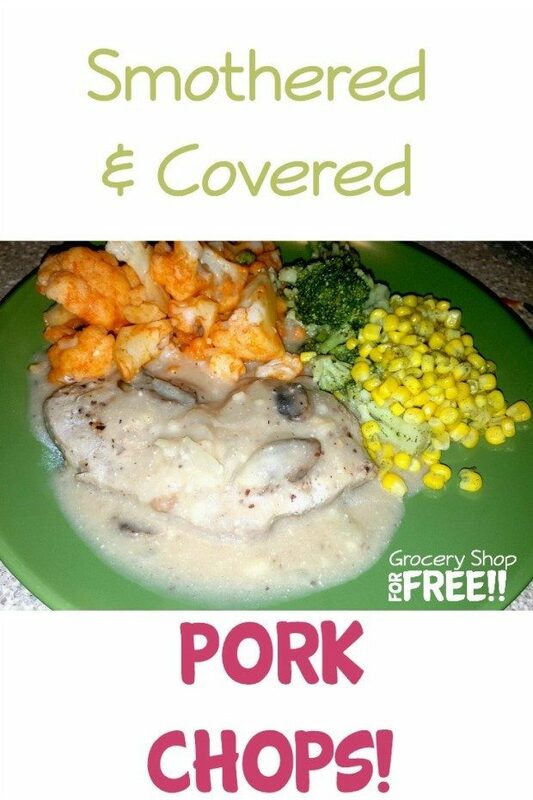 You are here: Home / Recipes / Dinner / Smothered And Covered Pork Chops Recipe! Around here Hubby is the cook! He runs the kitchen. When the kids were growing up, he couldn’t find a spoon! We used to laugh and watch him walk in the kitchen and turn circles. Our daughter would say: “Dad, whatcha looking for?” We would laugh as he told us and we pointed him in the right direction! But, now life is different, the kids are grown and gone and after my scare with Diabetes (which I got rid of 🙂 ), he started reading and studying about how to take better care of ourselves and he started doing the cooking. Right now we are a no sugar added household and it’s going great! It is hard to find things without sugar, you try it! But, we have managed to work it all out and manufacturers and brands are getting better about removing sugar or having a no sugar added product line, too. Season pork chops with salt, pepper, garlic powder, and onion powder, covering well. Dredge seasoned pork chops in Arrowroot Starch, covering completely, tap off excess. Reserve the remaining Arrowroot Starch. Heat olive oil in large skillet over medium-high heat. Brown the pork chops in already heated pan for about 2 – 3 minutes per side. Remove pork chops and set aside. Add butter, onion, salt, and pepper to the skillet. Cook until the onion is golden brown, about 8 – 10 minutes. Add 2 tablespoons of leftover Arrowroot Starch and cook, constantly stirring, about 1 minute. Add chicken broth, bring to a boil and cook about 2 minutes until sauce is reduced by about 2/3. Add pork chops along with sour cream back to skillet. Bring sauce to a simmer, then reduce heat to medium low and cook until the sauce is thickened into a nice gravy and pork chops are just cooked, about 10 to 12 minutes. Serve with your favorite sides! My favorite are his Bacon Lime Roasted Brussels Sprouts! He shares many recipes at his other site My Sugar Free Journey, check them out!